We all love the convenience of a short, precise text message, but it comes at a cost. More and more people are ill equipped to pick up a phone or arrange an in-person meeting, and often even the idea of speaking causes actual anxiety. 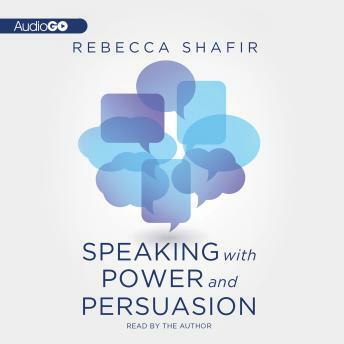 In Speaking with Power and Persuasion, licensed speech and language pathologist Rebecca Shafir gives you the tools to engage in meaningful communication with easy-to-learn steps. Unlike advice on improving your speaking that you might receive from a sales trainer or debate coach, Speaking with Power and Persuasion comes from a professional with a solid scientific understanding of the workings of the voice. The techniques Rebecca Shafir teaches are precise, practical, and sustainable. You learn what to do, how often to practice, and exactly why the exercises improve the impression you make on others.